Our Kentucky cutting boards make a wonderful handmade gift for a Wedding Gift, Birthday gift, Housewarming gift, Hostess gift or just about any other gift giving occasion. Holding true to the original spirit of ETSY, we still make all of our cutting boards one board at a time using locally sourced hardwoods! 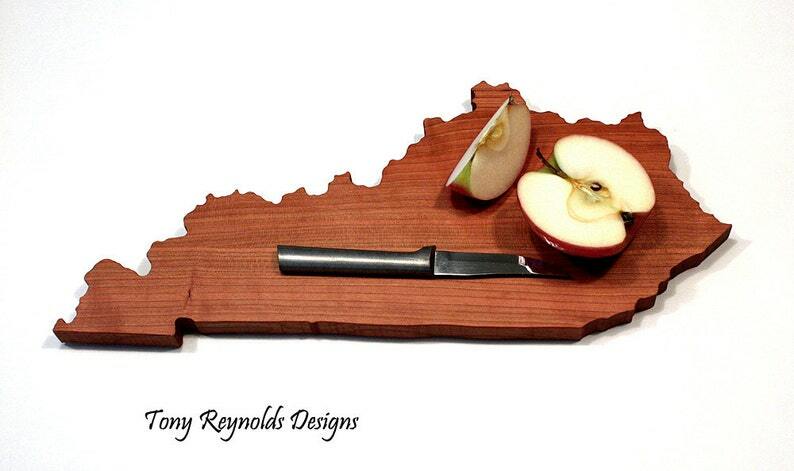 Our State of Kentucky cutting boards are handmade, heirloom quality and made from beautiful solid Cherry hardwood. It measures approximately 16.5″ by 7.5″ overall and is 3/4″ thick. The finish is 100% FDA approved as food safe. We use our own special blend of mineral oil, beeswax and carnuba wax to seal the board and give it a beautiful luster. Handmade by Tony Reynolds Designs in Granville, Ohio USA. It ships with care instructions in a nice white box suitable for gift giving and or wrapping. We can also personalize your cutting board with a name and or a date. Please select the desired option from the variation drop down box. Be sure to add the required information to the notes section of your order at checkout. If an option isn't selected the board will be shipped blank with no engraving. Simply wash the cutting board with soapy water using a sponge or rag and rinse off, then towel dry. NEVER allow your board to soak in water or place in a dishwasher as this could cause damage to your board. Every month or so you can apply mineral oil or our own oil/wax finish to the board to keep it looking great for years to come.